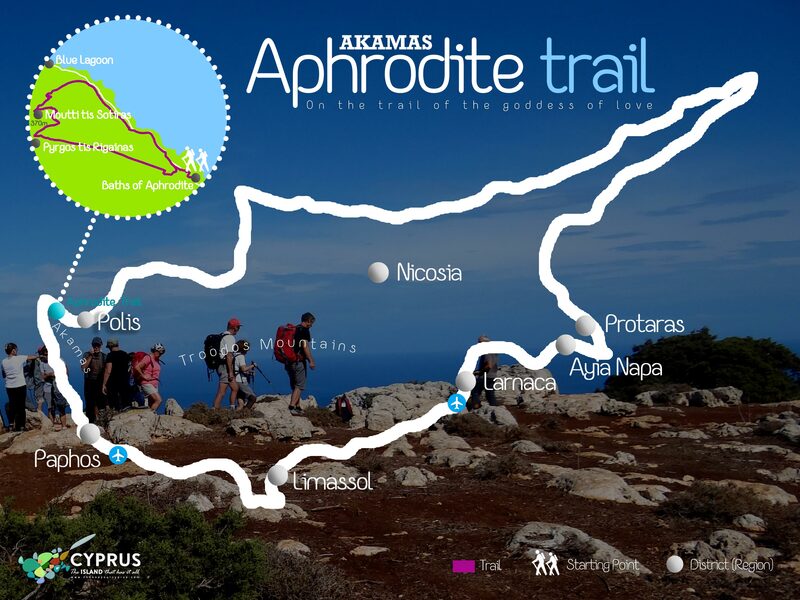 Discover the Aphrodite trail, one of the most beautiful Cyprus walks on the Akamas Peninsula, with its stunning views over the blue lagoons. The Aphrodite Trail is probably the most beautiful walk on the island and this walk will be a lasting reminder of your holiday in Cyprus. You will never ever get tired of the stunning views from the highest point on the walk. From Polis by hire car or taxi via Latsi to the tourist pavilion at the Baths of Aphrodite. From Polis in summer there's a bus service to the Baths of Aphrodite. In total - 2½ hrs. Why not begin with one of the finest walks on Cyprus? The nature trail which has been set up by the forestry department is along paths steeped in myth where, at the same time, you can become acquainted with the varied flora of the Akamas region. From the 370m high Moutti tis Sotiras there's also a spectacular view of the peninsula lying below. In April when the meadows are covered in a carpet of yellow chrysanthemum blossom, the Aphrodite Trail is an absolute all seasons classic! From the tourist pavilion at the Baths of Aphrodite you come past the souvenir kiosk along a path with paving slabs in 2 minutes to the legendary bathing place of the goddess of love. The dim and distant past Aphrodite is supposed to have frolicked with Akamas and Adonis in the pool that is fed by a spring. Today a huge fig tree shades this romantic spot. Follow the sign for the Nature Trail just in front of the pool. Cross over the stream bed of the Argaki tou Pyrgou, after a few metres pass a eucalyptus tree (No. 6) and 40m after that reach a dusty coastal path to Cape Arnaoutis. Immediately before you meet the coastal path, climb the mountain ridge sharply up to the left. After 2 minutes there's a fork in the path and you again go left. Moutti tis Sotiras lies in front and you keep left at a junction and shortly afterwards at a stately oak tree, you reach Pyrgos tis Rigainas. According to legend Aphrodite is supposed to have taken a rest here after bathing. A medieval monastery was later built at this spot of which only the Regina tower remains. 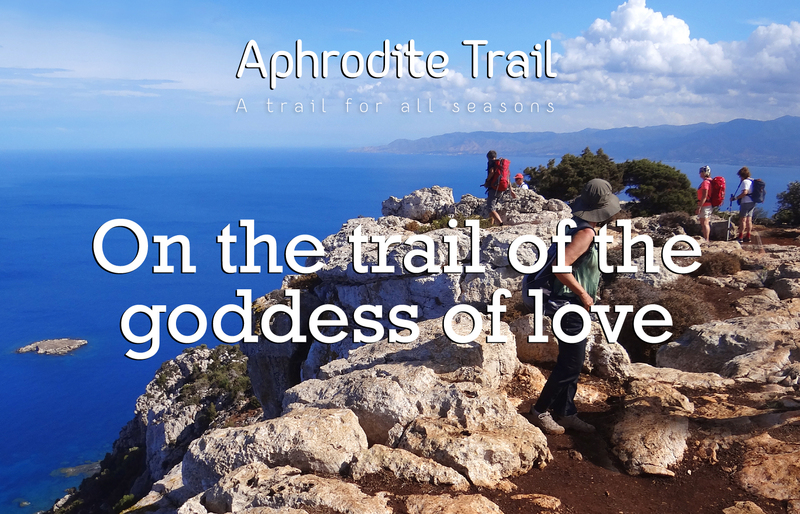 In front of the ruins of the monastery go uphill along the field path at the sign for the Aphrodite Nature Trail. The path heads straight for Moutti tis Sotiras. After 4 minutes a path joins from the right below and keeping diagonally left, continue uphill. Some of the characteristic plants and shrubs of Cyprus can be found growing close together along the path: the olive tree (A 25), the carob tree (A 26), types of gorse (A 27 and A 28), the mastic tree (A 29) and the strawberry tree (A 30). A good 200m after the strawberry tree, leave the field path to the right along a narrow path which snakes its way up the flank of Moutti. Different types of cistus (A 31-A 34) line the path which again meets the field path. Continue to follow this uphill and then veer sharply left from it again after a few minutes towards a viewpoint. From the flat summit plateau of Moutti tis Sotiras you can enjoy an imposing view of the fringes of the north coast of Akamas as far as the Cape of Arnaoutis. Be careful at the edge – there's a sheer drop from the plateau! Go back to the trail and the path now leads below and round the summit and down the north flank. Another marvellous vantage point with views of Cape Arnaoutis invites you to stop for a quiet rest. The mule path zigzags down to the coast and after the descent continues for a few metres to run parallel above the coastal path. Ignore the left-hand turn-off to the coast and stay at first on the nicer path until, after 10 minutes, this eventually joins the coastal path. Follow this back to the Baths of Aphrodite. Go straight on at the point where you briefly met the coastal path coming from the baths at the start of the walk and, leaving the mobile homes on your left-hand side, you reach the car park at the tourist pavilion. The Akamas peninsula owes its uniqueness not only to its attractive natural landscapes and rich natural environment but also to the vast wealth of elements of Hellenic history and mythology dating back 3000 years. Located on the north - west part of Cyprus, Polis Region is an area full of green, natural beauties, excellent sea and beaches. Polis still keeps its original Cypriot style, with many tranquil villages waiting to explore. The National Park of Akamas Peninsula is just a few kilometers away. Akamas peninsula: The national park of Akamas is just next to Polis Chrysochous. From Polis you are able to explore this unique unspoilt area.